With one week to go until ISE2019 in Amsterdam, we can’t wait to show off our latest solutions and ideas to customers both old and new! For us, this year’s show will be focused on informing visitors about our services and capabilities as a manufacturer, as well as demonstrating our latest products. As many of you have visited our booth at previous ISE shows, we wanted to display some fresh new ideas that you can carry through to your projects and installations; The main takeaway for customers visiting our stand at ISE this year should be an understanding that Future Automation provide ‘solutions’ as opposed to just ‘products’. Our three pillars of service include a ‘standard’ product line, ‘customisable’ options and our ‘bespoke’ design service. Our ‘standard’ range of products encompasses almost 1000 SKUs, all of which are designed, manufactured and assembled in-house. Ready to order online, over the phone or by email, these products cover a variety of smart home automation solutions. We also offer customisable variants of many of these products to suit a wider variety of installation. As we manufacturer every part of every mechanism in-house we can provide custom sized products which suit more specific installations. Finally, we have our bespoke design service. In addition to creating customisable variants of our products, our design team can work closely with you to produce one-off bespoke solutions for any scale of job. We’ve worked on some truly unique projects, from mind-bending room transformations to recessed ceiling mounted disco balls. Our offering this year will demonstrate how we will be utilising servo-lifting technology in future bespoke projects with several demonstrations of the capabilities of this pioneering technology. 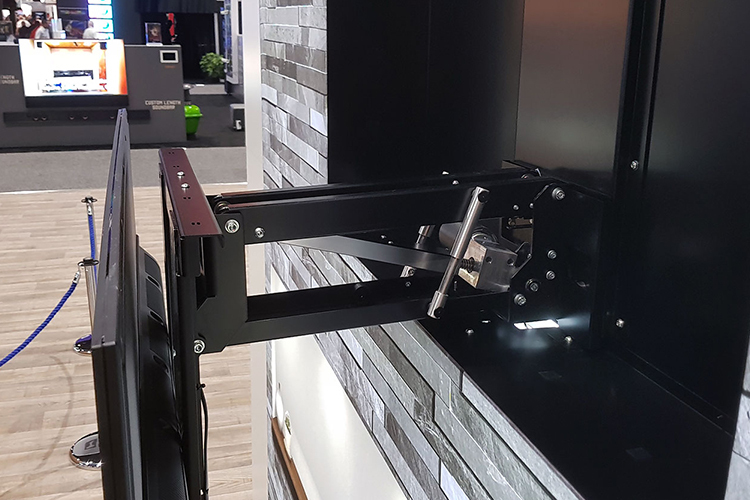 The aptly named SPLIT-BOX is a new super height efficient telescopic lifter, which is hidden within a bespoke cabinet that ‘splits’ to reveal an 82” Samsung display with height matched Leon profile side speakers. Officially launching for purchase Q2/Q3 of 2019, the SPLIT-BOX will be a sized to order solution for large format screens in standalone cabinetry. The servo motors inside this mechanism extend to full height (2200mm) in under 10 seconds which is no mean feat for a mechanism and display of this size. Alongside the SPLIT-BOX is the SERVO-LIFT; a prototype of new servo lifting technology based on our existing LSM-S platform. The speed of this lift must been seen to be believed as it can lift and rotate a 55” screen in 4.2 seconds. The SERVO-LIFT was developed to showcase the accuracy and speed of servo motors, achievable through constant communication with the control system throughout their movement cycle. This allows a much higher degree of control and accuracy that standard lifters and can also be easily scaled up for bigger and heavier applications. The SERVO-LIFT is a showcase for this new technology and we think it demonstrates the future of residential and commercial automation solutions, allowing us to design and manufacture quick, efficient and safe mechanisms for anything from display automation to room transformation. We are also showcasing our flush mount and recess mount LCP Din Rail Enclosures for Lutron Homeworks QS. The flush mount LCP7-12RCBO on show has been fully wired by our in house wiring team to a ‘Site-ready” finish, complete with Lutron modules, high quality ABB RCBOS and Isolator, termination blocks and internal wiring. 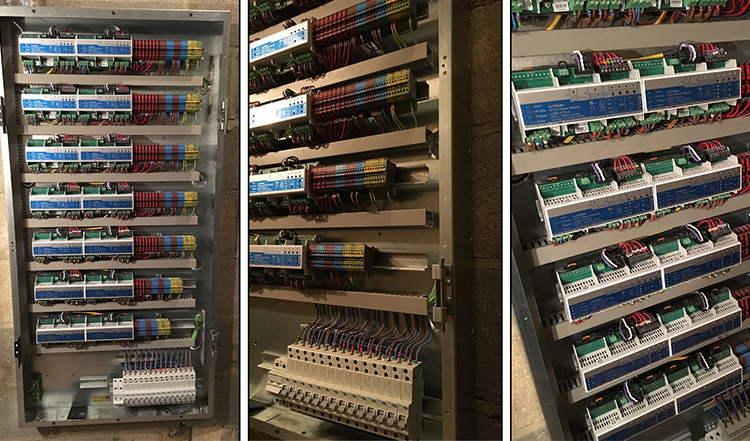 All our DIN Rail Enclosures are available wired ‘site-ready’, with debugging already performed by our professionally trained wiring team who immaculately cable manage every pre-wired enclosure. The recess mounted LCP-PD6 allows dealers to see an alternative DIN Rail Enclosure solution, designed to fit between 16” studs and provide a smaller form factory installation. 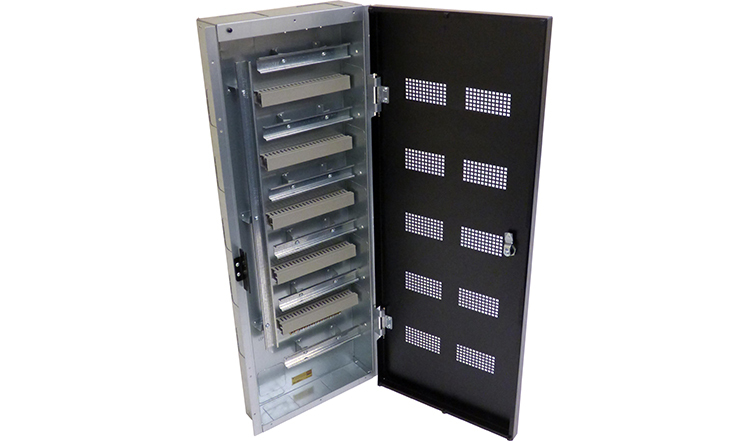 We also offer non-wired LCP panels which can be shipped to site ready for installation available in a variety of different sizes to accommodate projects of any scale. Our new look stand will also feature some of our more exotic display mounting solutions which, namely our QA2 Two Way Electric TV Wall Mount and our EAD Electric Advance and Drop TV Bracket. Both units are fitted into recessed WB In Wall Mounting Boxes, providing near flush screen fitting, as well as in wall socket and accessory storage. Lastly, we will be showcasing a new addition to the Future Automation family of distributed brands in the form of the Element One Versis Monitor Lift. We’re the exclusive distributor of Element One products across the UK and USA offering their commercial display solutions for the first time outside of Europe. 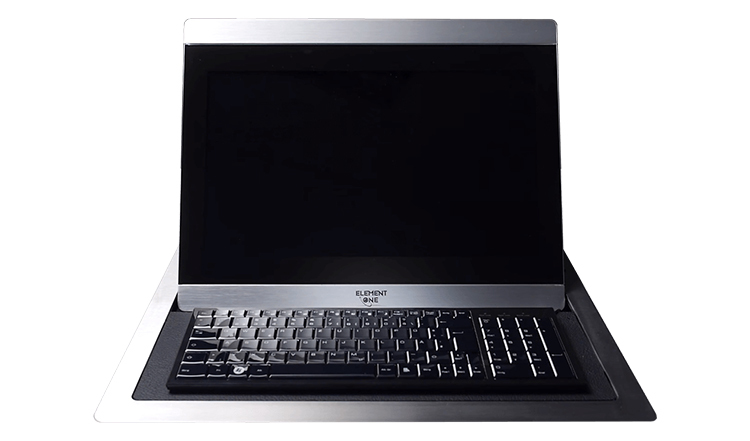 The model we will have on display includes a motorised 22” touchscreen display which slides back to a comfortable viewing angle to reveal a recessed keyboard and mouse. This monitor solution is perfect for boardrooms and commercial meeting spaces offering a discreet all-in-one desk mounting solution. Our new generation of mechanisms have to be seen to be believed and we can’t wait to see you at our booth (5-R85) this year.